Soundtrack Saturday: "To Wong Foo, Thanks for Everything! Julie Newmar"
While you were mourning Patrick Swayze’s death with a Ghost/Road House/Dirty Dancing marathon, Kelly Stitzel was doing something entirely different — and here’s why. I was saddened when I learned earlier this week that Patrick Swayze had died, after losing a hard-fought battle against pancreatic cancer. I knew there’d been at least one false report of his death since he announced his illness last year, so I was skeptical when I saw the first tweet about his passing from one of the news feeds I follow on Twitter. My heart sank when reputable news outlets started to report that his publicist had indeed announced his death. I knew it was going to happen soon, but it doesn’t make me any less sad to see another icon from my childhood suddenly gone. The moment I learned of Swayze’s death, I knew this week’s column would have to center on one of his films, and I didn’t even give a second thought to which one — it had to be To Wong Foo, Thanks for Everything! Julie Newmar (1995). I’m sure many of you would prefer that I’d dug up the soundtrack to Road House (1989) or Point Break (1991) — and I still might some day — but as passionate as some of you are about those cult classics, I have equally strong feelings about this little movie and Swayze’s performance in it. Before you laugh, hear me out. I know many people who think the Australian film The Adventures of Priscilla, Queen of the Desert (1994) is the ultimate drag-queen road movie and To Wong Foo is just a sad American attempt to match its success. I agree that Priscilla is the better of the two, but I saw To Wong Foo first, so I have a sentimental attachment to it. I also think it gets a bad rap. Yes, it’s safer, less edgy, and watered down, but I still enjoy it quite a bit. I remember learning about the movie several months before its release. This was 1995 and the Internet wasn’t a part of my life yet, so I either read about it in a magazine or saw something about it on TV. 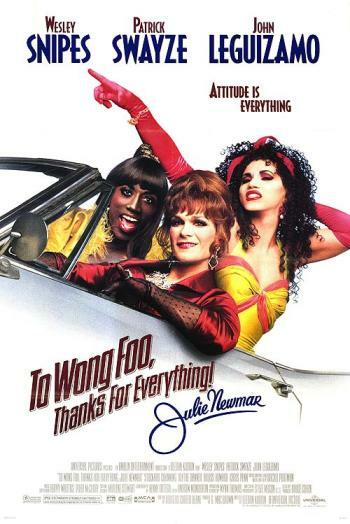 It seemed like nobody believed Swayze and Wesley Snipes were actually going to play drag queens, but then the trailer came out and the TV spots started airing, at which point there was no denying To Wong Foo was really happening. I was at a friend’s house when I saw the trailer for the first time, and I remember us both being awestruck by what we saw as well as confused about the movie’s title, which makes zero sense until you see the film. We both declared we would definitely see it when it came to a theater near us. To Wong Foo opened not long after the start of my senior year of high school. We couldn’t believe we were seeing Johnny Castle in drag — and he was beautiful and graceful! Who knew that Sam Wheat would make such a damn fine-looking woman? Same with John Leguizamo. In fact he was the most feminine of all. But Wesley Snipes — not so much. He was more along the lines of a bodybuilder drag queen. If you’ve never seen To Wong Foo, Swayze and Snipes play drag queens named Vida Boheme and Noxeema Jackson, respectively, who’ve just tied as winners of the New York City “Drag Queen of the Year” pageant. Their big prize: a trip to Hollywood to compete in an even bigger, national drag pageant. As they’re heading out to celebrate their shared victory, they encounter a crying “little Latin boy in drag,” Chi Chi Rodriguez (Leguizamo), who’s upset she didn’t win. Feeling sorry for her, and wanting to help turn her into a fabulous queen, Vida convinces Noxeema to take Chi Chi with them to Hollywood. Noxeema reluctantly agrees, and the pair cash in their plane tickets, rent an old Cadillac convertible, and head out on a cross-country road trip with their protegÃ©e. Along the way the trio are pulled over by Sheriff Dollard (Chris Penn). The redneck lawman tries to get fresh with Vida, who promptly knocks him to the ground when he discovers her “secret.” After the trio determine that Vida has killed him, they take off and try to put as much distance as possible between them and the scene of the supposed crime. However, disaster strikes again when their Cadillac breaks down in the middle of nowhere. They hitch a ride with a young man driving a pickup truck, who tells them he knows someone who can fix their car. He drives them to his hometown of Snydersville, a quaint little town that has, like, ten buildings, and introduces them to the owners of the town’s hotel and auto repair shop, a married couple named Carol Ann (Stockard Channing) and Virgil (Arliss Howard). Carol Ann gives them a room in the hotel for the night, which is also where she and her family live, and Virgil tells them he’ll take a look at their car. The next day — a Saturday — Virgil tells Vida, Noxeema, and Chi Chi that he has to order a part in order to fix the Cadillac, but it won’t arrive until Monday, which means the trio will be stuck in Snydersville for the weekend. They decide to make the best of it and set out to get to know the town’s seemingly unsophisticated residents. The queens learn there’s more than meets the eye when it comes to the Snydersvillians; they help them realize just how great their town can be, not to mention themselves. Meanwhile, Sheriff Dollard, who Vida didn’t actually kill, sets out to find the trio of drag queens and bring them to justice for knocking him out and leaving him on the side of the road. He eventually tracks them to Snydersville, where his attempts to apprehend Vida, Noxeema, and Chi Chi are thwarted by the town’s newly fabulous residents. Eventually the Cadillac is fixed, and the queens say goodbye to their new friends. When they finally arrive in Hollywood, one of them is crowned Drag Queen of America. The end. Not long after seeing To Wong Foo, I purchased its soundtrack. It’s chock-full of dance tunes, with the exception of an orchestral suite by composer Rachel Portman, who later won an Oscar for 1996’s Emma. The most notable song on the soundtrack album is probably Cyndi Lauper’s “Hey Now (Girls Just Wanna Have Fun),” a re-imagined version of her hit from the ’80s. It managed to make the top 40 — and in a few cases, the top ten — in some countries, and was a hit on the dance charts here in the U.S. The To Wong Foo album also featured a pretty hot track from Salt-n-Pepa, “I Am the Body Beautiful,” which plays during the opening credits of the movie as the drag queens are getting ready for the “Drag Queen of the Year” pageant. Alongside mid-’90s dance tracks, you’ll also find songs by Tom Jones, the Commodores, and funk divas Chaka Khan and Labelle. However, the official soundtrack album only featured about half of the songs in the movie, leaving off pretty much anything that wasn’t a dance track. Omissions include Barbra Streisand’s “Gotta Move,” Eartha Kitt’s “Je Cherche un Homme (I Want a Man),” and a few country tunes by the likes of Charlie Rich and David Allan Coe. While it makes sense that the country songs were chucked, as they do kind of throw a wrench in the soundtrack’s overall drag-queen vibe, it’s a shame the Streisand and Kitt tracks didn’t make the cut (I imagine getting the rights to those songs was a challenge). I’ve managed to compile the entire To Wong Foo soundtrack below, save a few instrumentals and a Sara Hickman song called “This Is a Man’s World.” Listen in honor of Patrick Swayze and one of his most memorable — and underrated — performances.